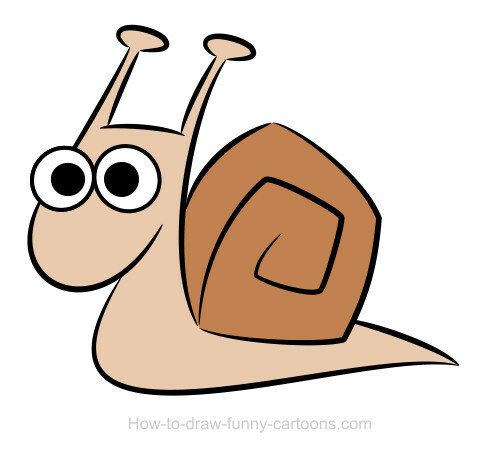 Snail drawings are fun to draw. 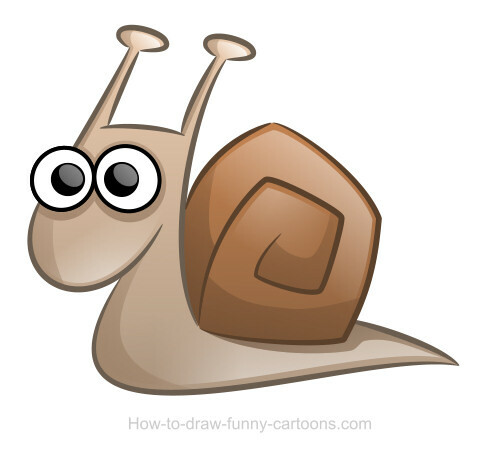 Let's try to create a nice cartoon character using basic shapes and easy special effects! To do so, you will need a pencil, paper, a device to scan or take a picture of your illustration and a vector software. Then, I'll show you how you can achieve a great cartoon character using some basic tips to create subtle shadows and great reflections. Please note that this drawing lesson can be quite challenging if you are not familiar using a vector application. First, you need to sketch the cartoon character. The drawing doesn't need to be perfect, but it must be good enough to be used as a template. As you can see above, I have created a very basic and simple cartoon animal. Next, scan your picture and open your vector software. 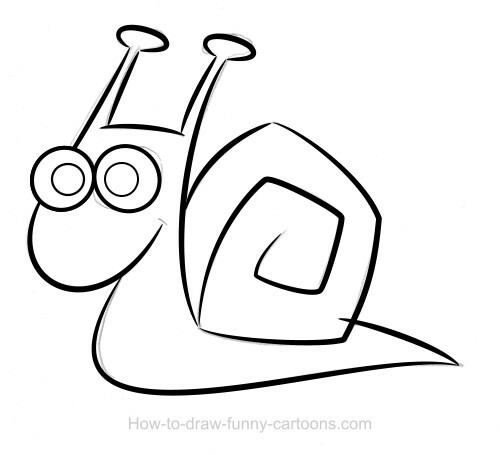 Using your drawing tool, add lines on the template as shown above. Once you are finished, create a new layer and draw plain shapes filled with the appropriated colors. This 2D character looks good, but I prefer to work on it a little bit more to give more volume to the illustration. To do so, select the gradient tool and add a second color on all solid shapes created previously. The character already have some depth, but we can do better. Add a layer below the one that contains the outlines. Then, create new shapes to represent stronger shadows. Don't hesitate to use a dark color because these shapes will be altered in the next step. Select the transparency tool and partially hide the shapes created in step 5. These shadows are now more subtle (and more realistic). To create reflection, I like to use large white shapes on areas that are directly exposed to the light source. Mixed with shadows, this effect will give a 3D look to my cartoon character. Once again, you need to use the transparency tool to remove the bottom part of these new shapes. Great! 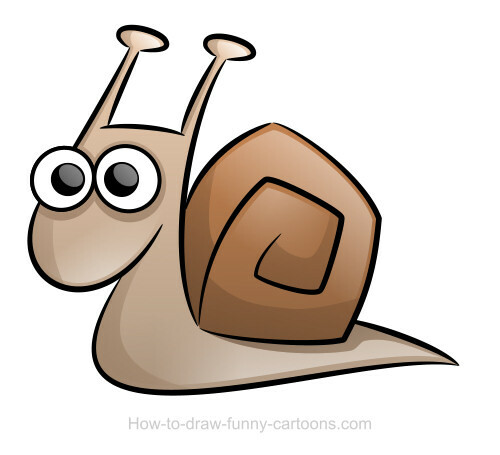 Your snail is now over, but we can do a single change to make the whole image even more interesting. Change de color of the outlines using a tone similar to the one used for filling the character. Just make it darker except for the eyes and pupils. Great! 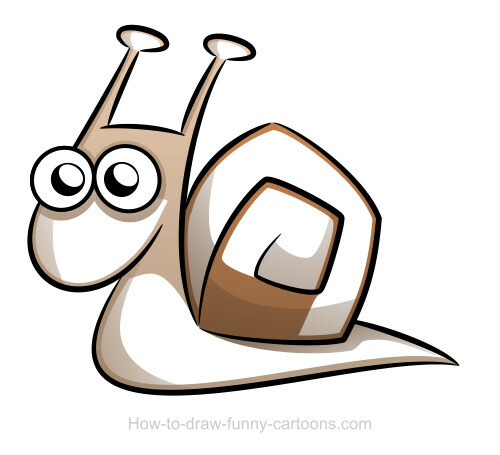 Don't hesitate to create more snail drawings. 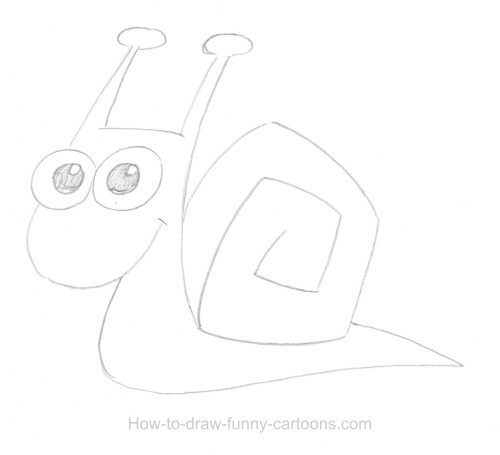 It's the best thing you can do to become even better at drawing.